More information: Victor MB, Richner M, Hermanstyne TO, Ransdell JL, Sobieski C, Deng PY, Klyachko VA, Nerbonne JM, Yoo AS. 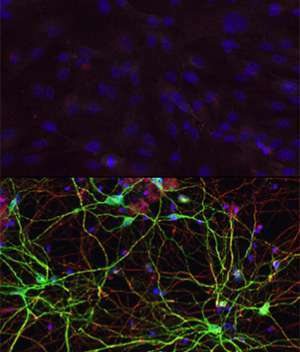 Generation of human striatal neurons by microRNA-dependent direct conversion of fibroblasts. Neuron. Oct. 22, 2014.